Senior Living: What Options Are Available? It’s never easy to say good bye to a home you’ve lived in for years (or decades). When your mother or father is no longer thriving at home, it can be overwhelming to figure out where to turn next. The good news: A variety of options are available to help aging adults receive the care and support they need to make the most of their golden years. Active seniors who don’t need daily help can still find lots of benefits from a senior living community. The private apartments at Heritage Communities offer full kitchens and comfortable living spaces, without the stairs, yard work and upkeep that traditional houses require. Independent Living at Heritage also comes with the perks of being part of a senior living community: classes and clubs, activities such as happy hour and billiards, restaurant-style dining and countless opportunities to socialize with friends. When seniors need help with everyday activities such as bathing, dressing, eating, transportation or managing medications, assisted living is an excellent option. Heritage Assisted Living combines comfortable, private apartments with access to compassionate caregivers 24 hours a day. 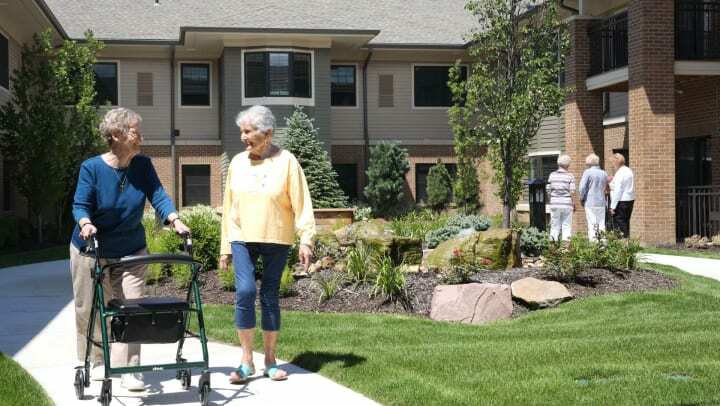 As with our Independent Living spaces, residents have a social world at their fingertips, with activities, classes, outings and restaurant-style dining. Heritage Memory Care residences are comfortable, secured environments designed for people with Alzheimer’s disease or other forms of dementia. Like Assisted Living, Memory Care residents enjoy private suites and access to common areas for meals, activities and social time. Our experienced and compassionate support staff helps Memory Care residents with daily routines as well as games, music and other activities tailored to the needs of those with dementia. Skilled nursing facilities, also known as nursing homes, offer round-the-clock medical care. Seniors who have chronic healthcare needs might stay in nursing homes for an extended period. Others stay temporarily while they recover or receive rehabilitation after an illness or hospital stay. Residents in skilled nursing facilities usually stay in a shared or private room rather than an apartment-style dwelling, as is more common in assisted-living communities. Skilled nursing is generally a medically-focused approach to care, with physicians driving most care decisions. In assisted living, by contrast, residents are more likely to choose what type and amount of care services they receive. Heritage Communities does not offer skilled nursing facilities. Home health services can provide extra peace of mind by bringing nurses and therapists to treat patients in the comfort of their home. Heritage OnCare Home Health Program is a Medicare-certified service that can provide physical and occupational therapy, speech therapy, wound care, disease management and other skilled nursing care. OnCare nurses and therapists work closely with Heritage Communities staff to bring an extra level of care to residents in our Independent Living, Assisted Living and Memory Care communities. If you’re not sure which option might be right for your loved one, we’re here to assist. We invite you to learn more about the senior living options at Heritage Communities. To schedule a tour, find a community in your region. We’ll help you find the option that’s just the right fit.